Lettuce is a non-starchy green leafy vegetable with mild flavor used over the centuries as a salad green. The glycemic index of lettuce is 15 which falls under low GI category. It has glycemic load of 1. It had anti-inflammatory, anti-microbial properties. It is popularly known as a sleep inducer. Is Lettuce safe for Diabetics? It is recommendable for diabetics to eat 3 to 5 servings of non-starchy vegetables in a day because it has low carbohydrate content and thus lower glycemic load (1 for 1 cup of chopped raw lettuce) the amount of carbohydrate allowed per meal for a diabetic is 45 to 60 g. Thus including vegetables such as lettuce will not exceed your carbohydrate count. It is crucial to equally distribute carbohydrates throughout the day. Also replace complex carbohydrates over simple carbs to manage your blood sugar levels because it is digested slowly into the blood stream and thus manages your appetite. It is extremely a rich source of fat soluble vitamin A which results in sharp vision. Vitamin A also acts as an anti-oxidant, hence reduces inflammation seen in diabetes. 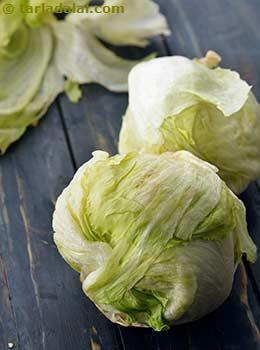 Lettuce is also beneficial in lowering your bad (LDL) cholesterol levels. Is Lettuce suitable for Weight Loss? Lettuce is extremely low in calories providing around 17 calories for 1 cup of chopped raw lettuce. Even if you tend to have an extra serving of lettuce, it won’t create much difference in the calorie intake. Try to include plenty of non-starchy vegetables in your weight loss diet to get better results, since they are exceptionally low in calories. Have small and frequent meals to boost your metabolism. Replace unhealthy calorie laden meal with low calorie wholesome meals. Control your portion size.